This frontier town at the Orange River in the Northern Cape is surrounded by typical dry Karoo Veld and was a setting in the Anglo-Boer War. Explore archaeological artifacts or the large Gariep River Dam. Water sports enthusiasts enjoy this Northern Cape area as much as nature and animal lovers. Find out more about the famous landmark called Magic Mountain and take a closer look at the beautiful Victorian and Georgian houses in Colesberg South Africa. Historic Colesberg provides the ideal stopover point. Visitors of the Northern Cape can turn off the N1 highway and travel into town for a peaceful break and a warm welcome from the local community. This town in South Africa is the centre of the Great Karoo and lies on the road between Johannesburg and Cape Town. Johannesburg is about 680km (423 miles) north and Cape Town is 790km (491 miles) south. This frontier town's famous landmark is the Magic Mountain which has been a central point around which the settlement grew up. 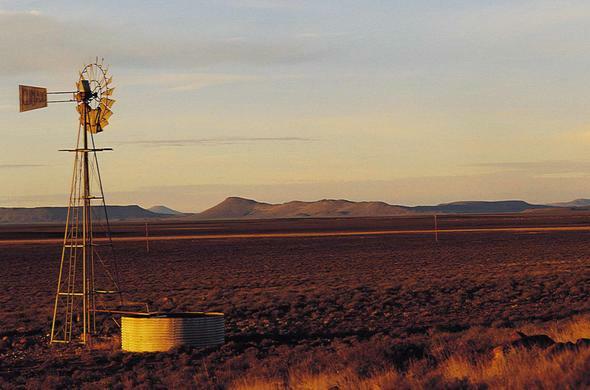 Colesberg is situated in typical Karoo veld and is surrounded by koppies or small hills. It is the most famous of these. Early travellers named it Towerberg' ('Magic Mountain') because is can be seen from a 40km (25 miles) away, never seeming to appear nearer the closer one gets to it. It marks the furthest reaches of the Cape colony in a town that has a turbulent history. The earliest inhabitants were hunter-gatherers who resided in the area of the Northern Cape over a long period of time. Things changed with the arrival of settlers (farmers and missionaries) in the early 19th century. Life on the edge in this hot and dry place, as in most frontier towns, attracted illegal gunpowder and liquor trading, making this area quite an unruly and lively place to be. In 1822 settler farmers petitioned for town status - like many others it was named after a colonial leader Sir Lowry Cole who was Governor of the Cape.Colesberg was one of the first districts in the Karoo to be invaded during the Anglo-Boer War, when the Boers crossed the Orange River in November 1899, and occupied the town - a number of skirmishes followed on this remote frontier. Many Boer and British soldiers are buried in the military and town cemeteries. Today, this town in the Northern Cape region of South Africa is a thriving agricultural centre for merino sheep and horse breeding. There appears to be magic in the grass or at least in the composition of the soil as many of Cape Town's most talented horses originated from Colesberg. The well preserved architectural styles in the town represent a unique mixture of Karoo cottage and Cape Dutch gables, decorative Victorian and evenly proportioned Georgian buildings. The older part of town south of the NG Kerk has a variety of a lovely accommodation and great restaurants. One of several national monuments here, the Colesberg-Kemper Museum houses fascinating relics and information on the rich history of this town in Northern Cape. Visitors can see among the exhibits, a collection of fossils, the start of the Diamond Rush and a photographic display on the Karoo Nomads. Many interesting Walking tours of the district and farms are a speciality of the museum. For archaeological enthusiasts, exploring the koppies in the area is a must. Stone-age artifacts and other interesting fragments of the past can be found around this town in the Northern Cape. Those interested in a wide variety of water sports can go to the large Gariep Dam on the Orange River, and take a tour of the 90 metre high dam wall. Nature lovers can visit the Doornkloof Nature Reserve home of Kudu, Eland, Brown Hyena, Bat-Eared Fox, Aardvark and Aardwolf and other antelope.